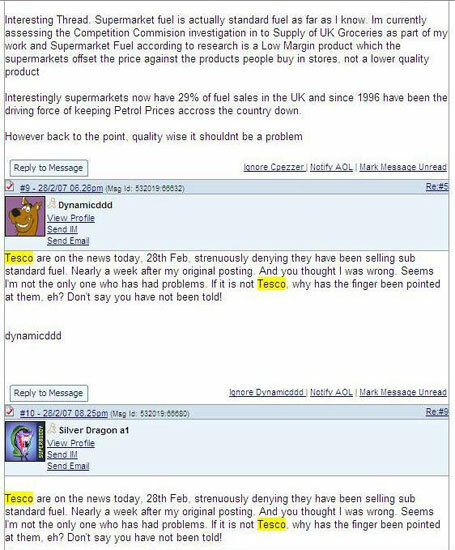 Yalert predicts Supermarket Petrol Crisis 25 days ahead of the News Breaking. The team at yalert started monitoring popular supermarket brands with our yalert software during the latter part of 2006. 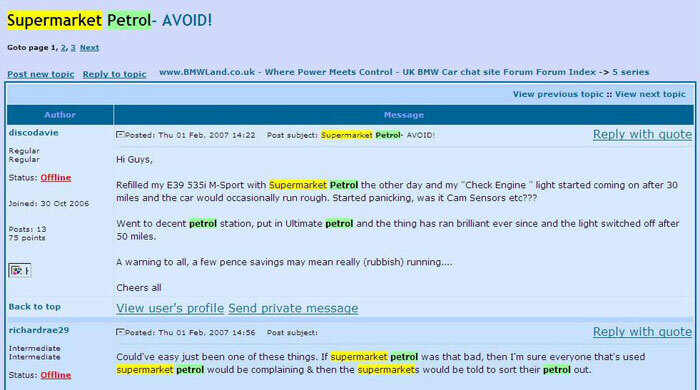 This included those supermarkets that sell petrol and our monitoring of web sites also included automotive forums and other motoring related web sites where supermarket petrol often gets discussed. Over the course of a normal month, as we witnessed during December and January supermarkets would only get the odd mention and not necessarily in relation to petrol. However, as February progressed our alert thresholds were triggered by a rising increase in the number of alerts pertaining to pre-identified keywords. "Refilled my E39 535i M-Sport with Supermarket Petrol the other day and my "Check Engine" light started coming on after 30 miles and the car would occasionally run rough. Started panicking, was it Cam Sensors etc??? Went to decent petrol station, put in Ultimate petrol and the thing has ran brilliant ever since and the light switched off after 50 miles. A warning to all, a few pence savings may mean really (rubbish) running...."
Yalert first started to sense that something 'funny' was going at the end of January with a small number of posts made on forums by car mechanics looking for assistance with dashboard warning lights and suspect oxygen sensors. 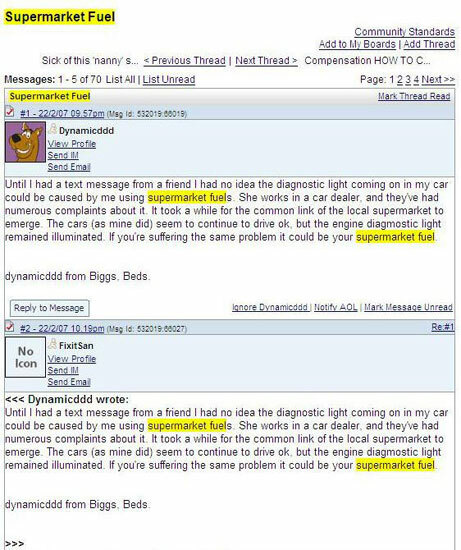 Closer inspection of these posts highlighted that individual posts in a forum could actually relate to a larger number of cases witnessed by one or more garages. By the 1st February these alerts had started to increase both in terms of frequency and volume on a day by day basis. All this was picked up by Yalert as it triggered a high priority alert based on an increase in the normal threshold of alerts. 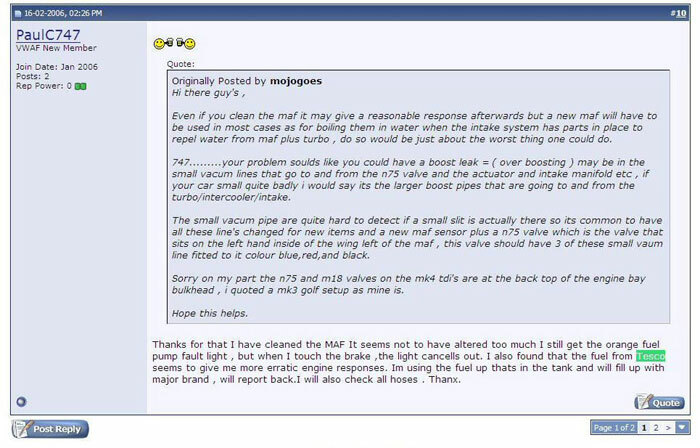 "I also found that the fuel from Tesco seems to give me more erratic engine responses. Im using the fuel up thats in the tank and will fill up with major brand, will report back. I will also check all hoses. Thanx." The alerts coming through with mention of Tesco and Morrisons really started to increase towards the middle of the month. 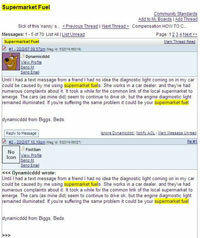 The long discussion at the AOL motoring forums highlights the extent of the debate and the concern of drivers. By this time we had already modified our monitoring to include supermarket petrol in general. "Until I had a text message from a friend I had no idea the diagnostic light coming on in my car could be caused by me using supermarket fuels. She works in a car dealer, and they've had numerous complaints about it. It took a while for the common link of the local supermarket to emerge. The cars (as mine did) seem to continue to drive ok, but the engine diagnostic light remained illuminated. If you're suffering the same problem it could be your supermarket fuel." 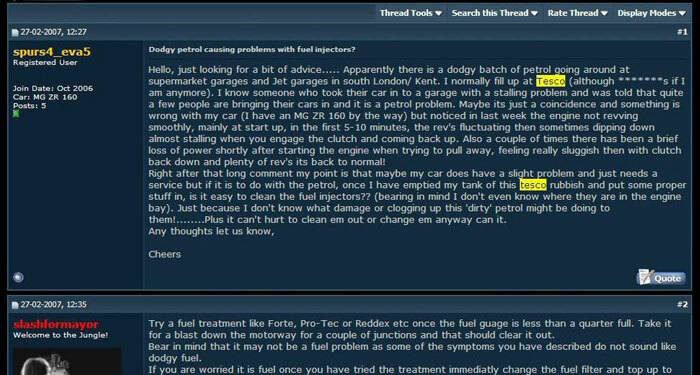 A number of threads in popular forums then attracted the attention of other concerned drivers and mechanics alike most probably being picked up by the regular search engines by this point. Drivers appeared to be discussing the issue in some forums despite not owning the make of car that the forum represented. 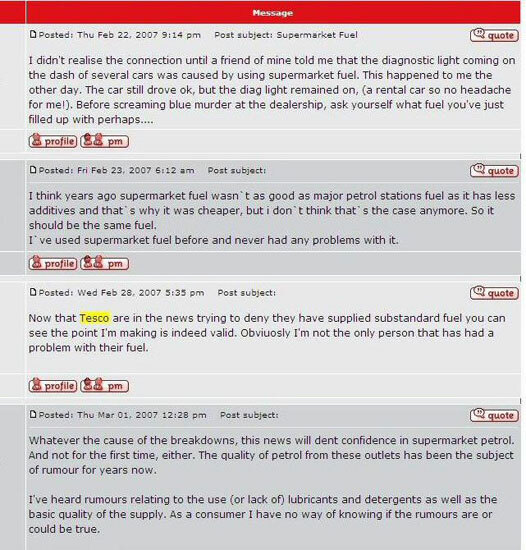 "I didn't realise the connection until a friend of mine told me that the diagnostic light coming on the dash of several cars was caused by using supermarket fuel. This happened to me the other day. The car still drove ok, but the diag light remained on……"
"Now that Tesco are in the news trying to deny they have supplied substandard fuel you can see the point I'm making is indeed valid. 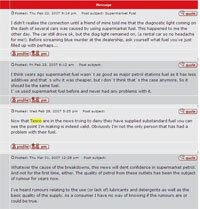 Obviously I'm not the only person that has had a problem with their fuel." 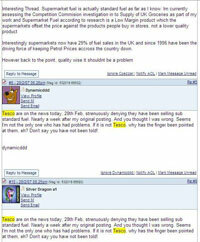 As of the news breaking on the 28th February Tesco were still denying the problem even existed. "Hello, just looking for a bit of advice..... Apparently there is a dodgy batch of petrol going around at supermarket garages and Jet garages in south London/Kent. I normally fill up at Tesco (although *******s if I am anymore)…….."
If only Tesco had been using the Yalert software then they may have been indentify the problem some 25 days ahead of the news story and avoided both a PR disaster and millions in lost revenue and legal claims.